Homespun Remedies by Dion E. Betts. 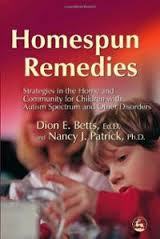 This book provides creative and practical strategies for helping children with autism spectrum disorders to function effectively at home and in the community. Split into 4 parts, this book covers home life, community, hygiene, and schools and organizations. Pp. 159. This entry was posted in Family Relationships, Our Library and tagged Autism Spectrum Disorder, books. Bookmark the permalink.